CCG’s Intelligent Couponing Program brings to your Couponing Program a level of detail and understanding never before available. Our solution provides powerful insights and a dynamic, detailed perspective on the success of your program. Imagine being able to know the participation and performance of your HCP Directed Coupon program while it is happening. Our unique processes provide an incredible understanding into the participation and redemption rate of your coupon program. You will see which Sales Reps, Territories, and HCP’s are actively engaged in your program, and which are not. And, since this information is available to you “real-time”, you can make tactical adjustments and respond immediately insuring program success and ROI. Clear Insights into Reps, Practitioner and Retail participation. CCG will reduce your time-to-market, improve your response rates and provide unique dynamic program insights. We will also alleviate you of the burden of coordinating and managing multiple suppliers by supporting the entire process from Project Management, Creative, Composition, Data Management, HCP/Rep/Consumer Distribution, Coupon Clearing, Web Design and powerful dynamic project reporting. 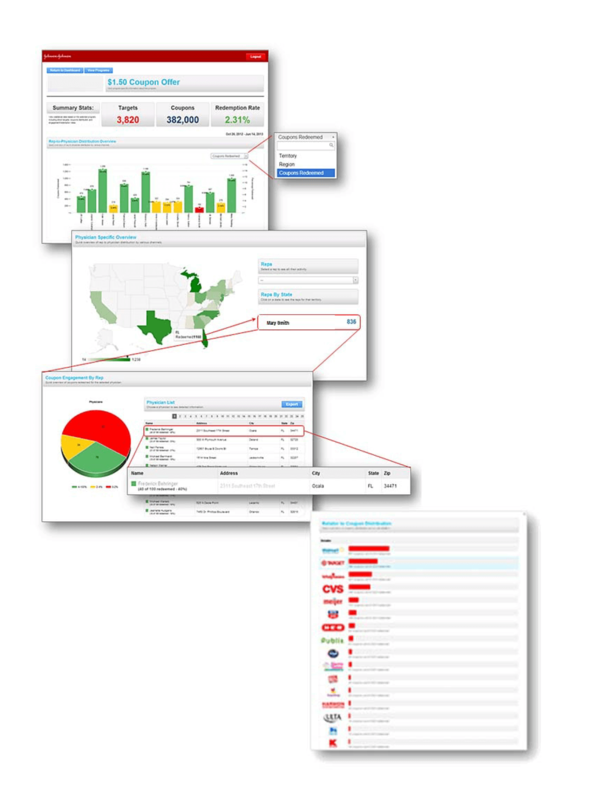 CCG’s Intelligent Couponing Program provides a suite of web based real-time reports through Executive Dashboards.